The CEO told a newspaper in China that the AAA free to play MMO made by ex-Blizzard folks is coming along as planned. Update Again: Mark Kern responded with beta details. See his comments here. Original Post: Mark Kern is passionate about the free to play model for Western MMOs. He's seen it work for lesser properties and markets like Korea and China, but Kern is convinced that it can fight against the stigma here in North America - and will make Red 5 a boatload of cash. Perhaps that excitement allowed him to make an announcement about the game's release before the PR people were able to craft a sufficient press release. 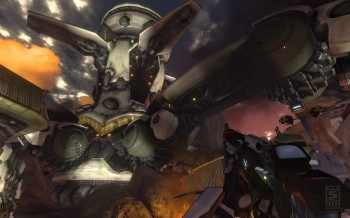 While attending the ChinaJoy Expo in Shanghai, Kern leaked to an interviewer that Firefall will launch December 2011. He later confirmed that December is not when the beta will begin, but when most players will be able to jump into Firefall. "They asked me when the game was launching, and I said December. For some reason, they interpreted that as Beta," Mark Kern said. "Sorry for the confusion." The full interview from an organization known as Tencent Games also gave some percentages on how complete FireFall is. For instance, the game is 50 percent done, with PvE content faring a bit better at 75 percent complete while the maps are almost finished at 90 percent. The team is still working on new concepts and testing them out, though. I don't know about you, but that doesn't sound like a game that's ready to launch in less than six months. Some open betas of MMOs last more than six months and Kern did not confirm when such a test would begin for FireFall. Hopefully soon. But after more about the FPS gameplay of FireFall, I wonder if Red 5 is trying to release it well before SOE's Planetside 2. The two games will directly compete in the MMO market both with a sci-fi shooter setting, and free to play business model. I have reached out to Red 5 Studios for a statement and I'll update this post if any more news emerges.